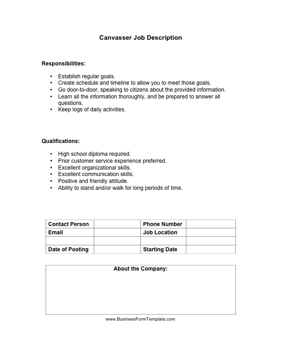 This canvasser job description can be used to make sure that every employee understands their duties and responsibilities at work. &Create schedule and timeline to allow you to meet those goals. Go door-to-door, speaking to citizens about the provided information. Learn all the information thoroughly, and be prepared to answer all questions. Keep logs of daily activities.